This Beef Nachos with Slow Cooker Chili Con Carne is loaded with savory goodness, including a secret ingredient. 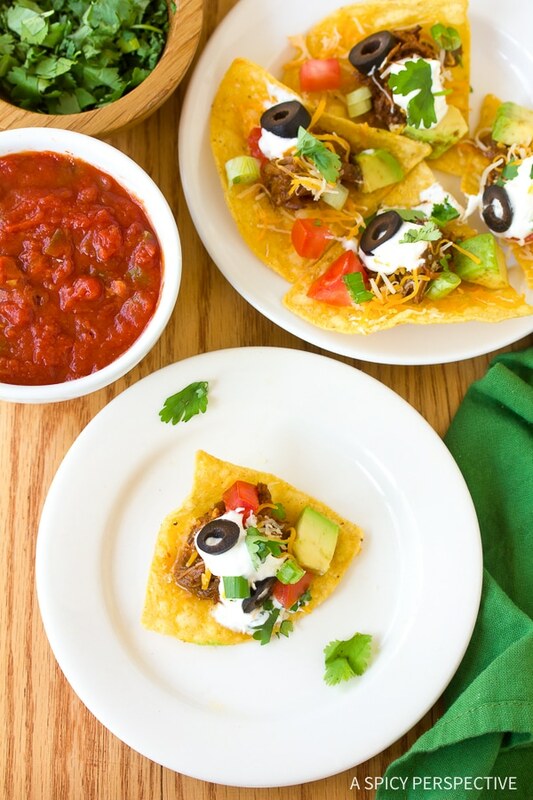 These sweet and Spicy Beef Nachos will be a hit on game day! If there was a game-day food I just couldn’t live without, it would have to be beef nachos. Crispy corn chips holding up an enormous pile of warm spicy beef, and melting cheese, with cool tomatoes, avocado, and cilantro sprinkled about. I could eat beef nachos any night of the week, but am particularly fond of them for football parties. Have I ever told you about the escapade that takes place in our house during football season? Well, let me start by saying Lt. Dan grew up in South Bend, Indiana and he is a die-hard Notre Dame fan. Our first couple years of marriage, I used to worry about his mental health when he watched Notre Dame football games. The ranting, screaming, bouncing and pacing, was something I had never witnessed before… Even growing up in a home with two older brothers. I used to keep a sharp eye on him every game day, to make sure I didn’t need to have him tested for some sort of psychiatric disorder related to football. Nowadays, I can scoot him out to the man room for football games, and all is peaceful in the house. Beef Nachos with Slow Cooker Chili Con Carne is the perfect snack to serve at your game day party. Whether you’re roaring with victory or wallowing in defeat, this sweet and spicy slow-cooker chili con carne is a comfort to anyone with football fever. 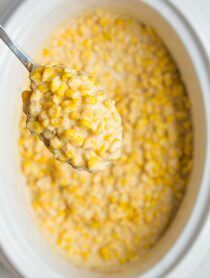 I love slow cooker recipes like this, because you can dump everything in the crock-pot and walk away for several hours. Later when you are ready to serve your guests, it only takes a few minutes to pull the nachos together. My Beef Nachos with Slow Cooker Chili Con Carne has a secret ingredient that really makes it sing… Apple Butter. You wouldn’t believe the depth of flavor a little apple butter provides to this savory dish. The unexpected touch of sweetness balances the spicy heat of the sauce and creates a beautiful platform for all the fresh cool toppings. Beef Nachos with Slow Cooker Chili Con Carne - A sweet and spicy slow cooker chili con carne makes this beef nachos recipe! Pour the enchilada sauce and apple butter in a crock-pot. Place the beef roast in it, followed by sliced onions, garlic, salt, and red pepper. Cover and turn the crock-pot on high for 4-5 hours, until the beef is falling apart. Using two forks, shred the beef roast into the sauce, and leave on warm until ready to serve. Preheat the oven to 350 degree F. Arrange the tortilla chips on a large rimmed baking sheet. Sprinkle half the cheese over the top and bake for 3-5 minutes to melt the cheese. Scoop the chili con carne over the chips, and sprinkle the remaining cheese over the hot beef. Top with any additional toppings and serve immediately. I havent made it yet, but I intend to. I love your recipes. My comment is about ND. One nephew graduated from there in 08. I have another nephew in his third yr. Such a fabulous campus and school. There’s nothing like attending a ND football game. While we’re eating our nachos I’ll be singing the fight song! ❤? I laughed at your description of bouncing and ranting and pacing. That is what my dad does still to this day. I would never invite friends over for game day, though, because I was always too afraid of what they’d think of my dad’s football antics. I adore nachos, and slow cooker beef definitely needs to come to our house. A super snack for the super bowl! The beef takes these a step above ordinary nachos. Whoa! Applesauce…I need to try this, sounds wonderful! Nachos are my weakness. Sometimes I make BBQ beef or pork nachos with a little bbq sauce, cheese, chopped scallion and sour cream. 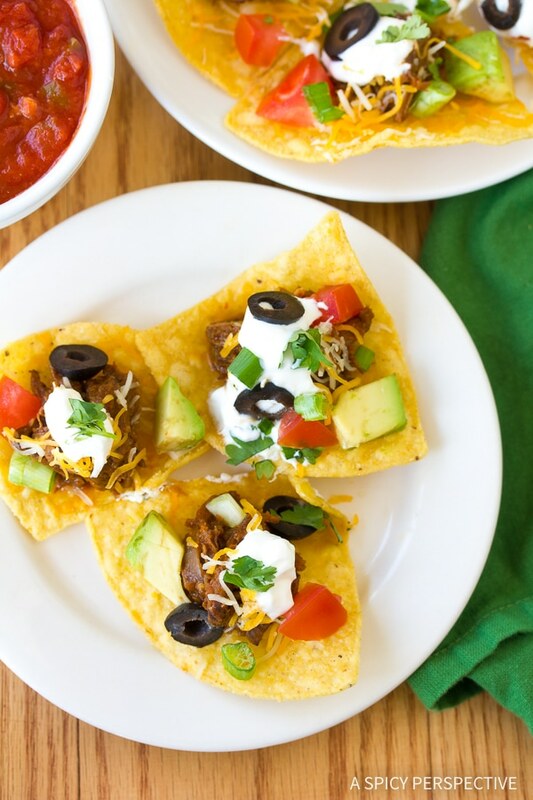 Ooh, I love nachos–definitely one of my favorite guilty pleasures! Love the sound of these! They look incredible!! Yummy!!!!! I wish that I’d seen this before the game a few weeks ago! How bout a ROLL TIDE ROLL!!!! Who wouldn’t want to devour these?! Yum! I’m not a big football fan, but I wouldn’t mind going to town on a plate of these while watching my favorite Sunday February event – The Oscars! Love the sound of this! We are huge nacho fans at my house! Sweet and spicy? Nachos? I’m there! Sommer, you have outdone yourself recreating a simple, beloved dish and elevating both the flavor and texture profile for a new spin. Apple butter? With Chili Con Carne? With nachos? Who knew?! Pinning and tweeting! Bring these babies on, super game or not! I just love the slow cooker chili!! Years ago I had a boyfriend who took the loss of his favorite hockey team so extremely that I worried for his well-being. :) The nachos look amazing! YES!! I love nachos and i love slow cookers. WOW, pass the plate, this looks amazing! These would be the perfect game day food!! there isn’t one thing about this recipe that I don’t like! mouth watering! We love nachos around here. 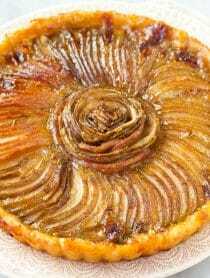 The applesauce is a genius ingredient, I love it! I love it and I love Musselman’s Apple Butter! I just made chicken wings with them. Amazing! Your nachos look fabolous! Love the idea!! Apple butter in your chili is brrrrrrilliant! Apple butter? In Nachos? Weird. But cool. Can’t wait to give it a try. Nachos are a staple in our house too. When we were planning our wedding and it seemed to me that I was getting to make too many decisions I asked my then fiancé, “If you could have one thing at our wedding, what would it be?” I think he at first said, “You” or something sweet like that but then I pushed him until he admitted that it was “Nachos”. And so nachos, there were! Christine, that is hilarious! Love it!! Apple Butter in chili – I love that idea Sommer! What a creative recipe. Now I wish we were getting together for the Super Bowl! Game day can’t come soon enough to whip these up! I love your addition of the apple butter in these! OMG this looks amazing. 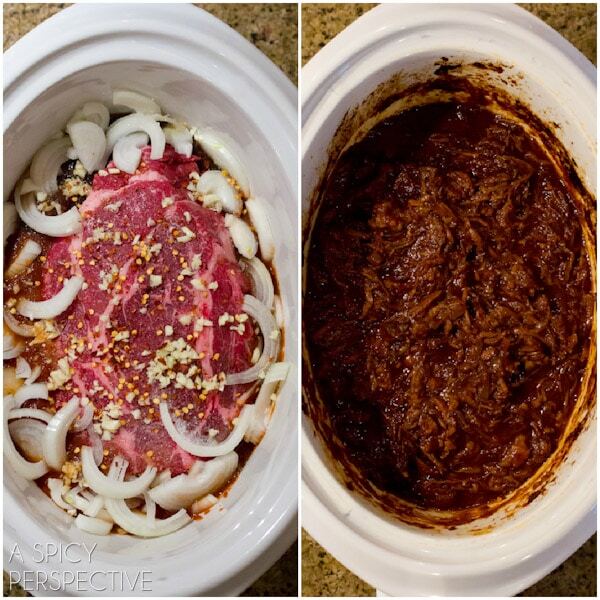 LOVE the side by side photos in the crockpot!! PINNING and making soon! Now this is my kind of snack! I like the apple butter in there for the sweet undertones! Amazing flavors, just down right amazing and your photos are spectacular! I LOVE nachos of all kinds. I don’t discriminate. 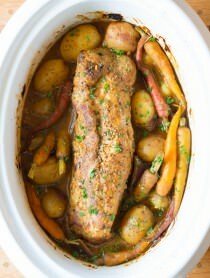 I can’t wait to give these a try and I love that the meat is made in the crock pot! wow, that carne looks absolutely amazing! I love that it’s just completely shredded after being in the slow cooker. Perfect football snack for sure! Looks amazing Sommer! Perfect for the game! Love these nachos! Perfect for the superbowl! oh my goodness, I’m so glad I ran across this recipe! nachos are, by far, by biggest weakness, and these look amaaazing… plus, I have a 3 lb beef chuck roast in the freezer! this will be a perfect superbowl treat :) thanks! I can’t watch,,,I’m from New England . I’ll just have these nachos, thank you very much.